Are you unhappy with your smile? Do you wish you could change the size, shape or color of your teeth? Porcelain Veneers could be your answer. Veneers, also called porcelain veneers, laminate veneers, or dental veneers are probably the most esthetic means of creating a more pleasing and beautiful smile. Veneers are very thin pieces of durable, tooth shaped porcelain that are custom made (for shape and color) by professional dental laboratory. They are bonded onto the front of teeth to create a beautiful and attractive smile. Veneers have a variety of uses such as, to fix chipped teeth, to improve color and shape of teeth, to seal small gaps, or to help align teeth. Using an adhesive substance, the thin shell-like veneer is bonded to the tooth, leaving you with a superb row of beautiful teeth. Veneers generally take 3 hours in total at the dentist (around 3 visits) and involve molding the teeth, a "trial fitting" and last of all, bonding the veneer to the tooth. Veneers are strong and durable, and will last around 7-10 years. Do all porcelain veneers look the same? No, porcelain is very lifelike when done correctly. The difference in the porcelain is the skill of the technician. Also, your smile is custom-designed specifically for you. There are various shapes in veneers. 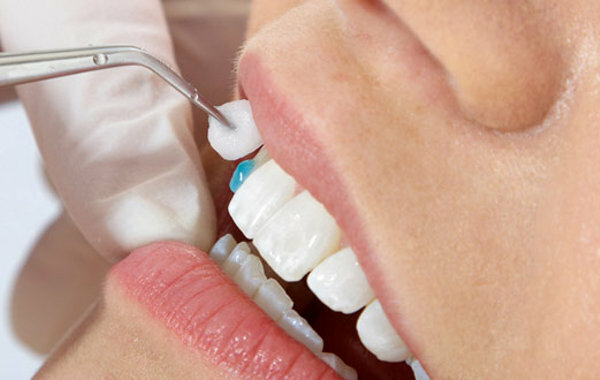 Creating the perfect smile requires a blending of precision dentistry, perfect planning and an eye for detail. How do I know the end result will be what I want? Producing a perfect smile is an art, as unique and individual as a person’s features. The components that produce a beautiful smile require great attention to detail on a tooth-by-tooth basis. With proper design measurements, the exact proportions of a new smile can be achieved. Meticulous records, measurements and photographs are used to evaluate your smile needs and determine what it will take to produce the perfect smile for you. A waxed model is made from an impression of your teeth before you begin, allowing you to see the result that can be achieved with porcelain veneers. Designing a patient’s porcelain restorations begins with a photography session. Models are also taken of the patient’s teeth and these are also given to the laboratory. A blueprint of how the patient’s teeth will look is the model used to make the patient’s temporaries. Interaction that is both face-to-face and visual gives our patients the assurance that their porcelain veneers or porcelain crowns will be made to the highest standards. They look and feel just like normal teeth - you can’t tell the difference!